What some people call coveralls or covies others call overalls, boilersuits, onesies or jumpsuits. Why get your own clothes dirty? Wear an overall over your clothing, and protect yourself.... and your clothes. 1) Non FR, Polycotton boiler suits are generally used indoors for mechanical work protecting the worker from grease and grime. The polyester content in a polycotton coverall, helps the durability of the wear: the shape and colour last longer, while the cotton makes it feel soft and breathable. 2) Navy or royal hi viz coveralls (in Nordic-style ie with reflective tape over the shoulders, arms and legs) are standard issue where there are moving winches, trucks and forklifts. The reflective tape bands are a key visual safety feature. These can be flame retardant (if the coverall is to EN 531 or EN11612) for extra FR safety. 3) Across the North Sea, red or orange FR coveralls are the norm. (Red or orange - so that you standout against the dull/dark background or sea). 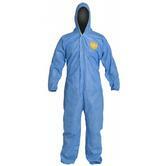 These are typically 100% cotton coveralls treated with a flame resistant Pyrovatex or Daletex chemical treatment. The FR treatment usually lasts for over 50 non-domestic washes. 4) There are also Proban FR coveralls - which is another chemical treatment to make garments flame resistant. Proban typically lasts for about 30 washes. 5) The best flame retardancy comes from fabrics that are INHERENTLY flame retardant (ie the treatment is inherent to the fabric and so can never wash out). Man-made modacrylics and aramids (such as Nomex) are seen as the safest FR protection, because they are inherently FR, such as the Wenaas Lightweight Nomex aramid FR coverall, where the material is as thin as a shirt, but certified FR. Coveralls typically weigh 350g/ms2 (9oz) for normal use, down to a lightweight 250gm (7oz) for temperate warm climates. The lightest weight overalls are usually the inherently FR coveralls. These are made with aramid or Nomex. These can be made from material as thin as 150gm/m2 – which is as lightweight as wearing a shirt, such as the Wenaas 150gm Nomex aramid FR coverall. 6) We also do WINTER/INSULATED/THERMAL/QUILTED FR coveralls: these have an FR quilted lining on the inside, which protects you from the nippy, icy winds. 7)Coveralls can also be made with 2% carbon fibre – to allow them to earth any static build up. These are Anti static coveralls (to EN 1149 standard). FR AST - FR & such as the Roots RO18090 anti static FlameBuster. 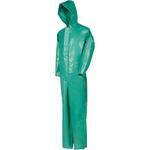 Antistatic coveralls are becoming much more popular, due to their extra safety features. 8)Some of our coveralls also have ELECTRIC ARC Protection (IEC 61482) to protect workers in areas where a flash arc of electricty could arc out .....and literally fry them - if they didnt have an electric arc suit. 9)Why bother with expensive overalls, if you can get disposable boilersuits? 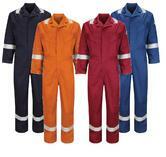 Disposable coveralls can protect your clothes and protect you from many electric static, fire or chemical risks. 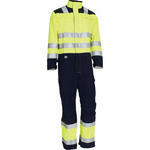 North Sea Workwear probably has the largest range of EN compliant FR coveralls online, in stock in the UK. We carry tens of thousands of coveralls from what we believe are the best FR brands, such as Bulwark (the largest FR workwear company in the world), Dickies, Portwest, Roots, Wenaas etc. Happy hunting. PS we recommend that to reduce your risk of skin burn that you layer up with FR under garments or base layers, which are worn under any coverall.